As I’ve made abundantly clear, I’m an automotive space-utilization fetishist. This car I want to talk about right now might just be the most extreme example of packaging ever in motoring history. It’s the Railton Mobil Special, built to break and set new land speed records in 1938. There’s never been anything quite like it before or since. The Railton Mobil Special was designed by Reid Railton, a gifted automotive and nautical designer who may be best known for the car marque named after him, Railton, which used Hudson straight-8 engines in a lighter, leaner body. The combination of British-made car with a light body and a big American engine would become a staple of desirable cars, the AC/Shelby Cobra being the most famous example. Railton was doing this from 1933-1940, so you might be able to argue that the whole Anglo-American sports car niche was started by him? The car was driven by the legendary John Cobb, one of the few people willing or able to drive a beast as unorthodox and radical as the Railton Mobil Special. It’s this unorthodoxy that I want to focus on here, specifically how the car was laid out, and how everything was packed inside the massive, streamlined aluminum hull. Nothing about this car is conventional. The Special was powered by a pair of aero engines, in this case supercharged 1928 W12 Napier Lion engines that were used in a large number of aircraft. Interestingly, the engines Railton used actually came from a boat. The W12 configuration means that there were three banks of four in-line cylinders, forming a sort of downward-pointing arrow shape. Each engine weighed about 1120 lbs, and each made around 1480 horsepower, for a total of nearly 3000 HP for the car. If Railton had tried to couple the engines together in a more conventional manner, there were simply no transmission or transaxles that could cope with all the power. So, Railton made a decision that sounds, well, nuts: each engine would have its own transmission and final drive, with the front engine driving the rear wheels and the rear engine driving the front. That gave the Railton Mobil Special all-wheel drive, but also a crazy configuration that makes packaging wildly difficult, with engines at opposite ends of the car with driveshafts crossing the car in both directions. How can he fit all this in the car without making something so wide that it would be an aerodynamic nightmare, with a frontal area the size of a sectional couch? The answer was another crazy-sounding idea: use a backbone chassis, but have that backbone be S-shaped. That way, the engines could be placed in the chassis at angles, which will let them nest together in a sort of Yin-Yang setup. That’s astounding. If you look carefully, you’ll see all sorts of other remarkable details about this car. Like see the part labeled ‘ICE TANK?’ That’s there because instead of having to deal with a radiator and air intakes and fans and all that crap, they just used a big tank of ice water to cool the engines, and after that water was pumped through the engines, it was used to cool the massive drum brakes used to turn all that speed into heat. The tank was refilled with ice after each run. It’s huge. Those wheels are like three feet tall! And note the extreme cab-forward placement of the driver; the seating position is sort of like an old Volkswagen Microbus, only this Bus can go 400 MPH and has 24 cylinders of fury screaming right behind you. It looks like driving it must feel like being strapped to the nose of a horizontal, piston-driven rocket. On September 15, 1938, the Railton Mobil Special took the land speed record with a run of 353.3 MPH, and also became the first car to break 350 MPH. 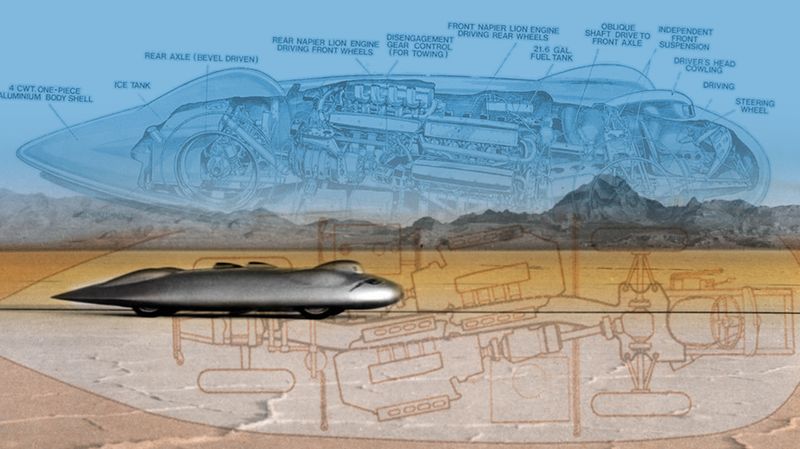 Years later, in 1947, the same car came back to become the first car to break 400 MPH, with a one-way run of 403.1 MPH. It’s an amazing car, and it will always have a special place in my car-packaging-loving heart because of its potent, intoxicating madness. Two W12 engines, driving wheels at opposite ends of the car, set at an angle, with a freaking chassis backbone shaped like a serpentine dragon?